My wife was shopping. And not the typical hunter/killer cruise missile 24-pack-of-toilet-paper-ice-cream-and-that’s-it. Ok, full disclosure, I was indulging in the same shopping but the used book section of our local thrift store is smaller than the clothing department. I was bored. HackerNews lay stagnant, no one was tweeting (folks having a life instead of entertaining me? How inconsiderate!). In desperation I turned to the Google Play store and found what would be my obsession. Calculords is a collectable card game based on math. What follows is my attempt to build a solver. Along the way we’ll learn about algorithmic complexity, garbage collection & dynamic programming. 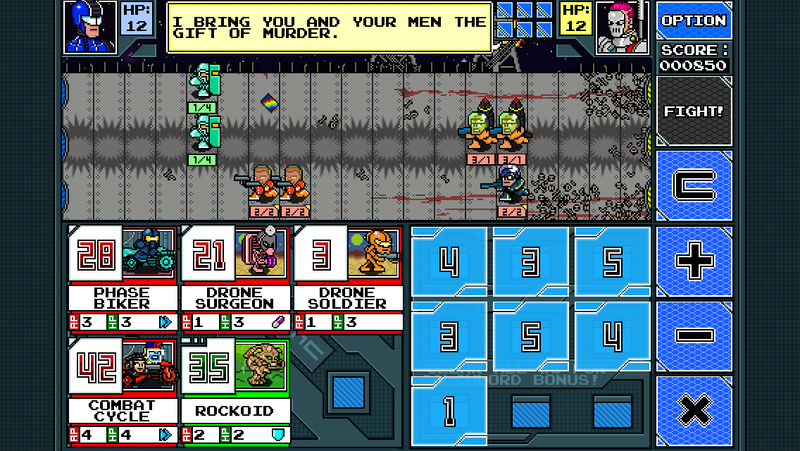 The player generates numbers to match the cards on the left using the blue numbered cards on the right combined with the three operators on the far right. For each match, they summon the creature into one of three lanes on top. If the player manages to use all of their blue cards, they’re rewarded with another set of cards to drop even more fighters on the field of battle. The mechanics of battle are irrelevant here - we’re concerned about the math. Punch in the numbers only to realize I had yet another off-by-one error. This worked well enough that I was able to beat the first two levels but victory on the third eluded my grasp. I started grinding away, trying to gather enough good cards. The grind was dreary. In the words of every infomercial ever, there has to be a better way™! The first thing I needed was better hardware. My current solution used a processor running at 1.19e-08 MIPS. While slow, this one has sentimental value (my parents gave it to me). The slow meat-CPU interacted via a digital medium (my fingers) with my phone, a machine running 490,000,000,000 times faster. Why not offload some of the work? Better yet, there was a laptop idling on my lap as I idled at the game, and that CPU was 21.4 times faster than the phone. A round on the meat-CPU took me 5-10 minutes with no guarantee that the solution I found was optimal. Converting the processing from meatspace to cyberspace meant I needed a concrete algorithm. This initial naive implementation recursively searches through the entire problem space. make a recursive call, passing the result and the unused integers. Finding the best solution is an NP problem, requiring that we execute every operation against every possible numerical combination. In the words of my esteemed (and lazy) math professors, proving so is left as an exercise to the reader. Ostensibly, this problem is O(n^2 * m), with n as the list of integers and m being the number of operations. Comparing everything to everything else would make this n^2 * 4 (yikes! Exponents usually mean code that takes quite a while to finish up). We do get to cheat a little: We don’t need to compare a number to itself and once we’ve compared two numbers, we can get away without re-checking them the other way around. The formula for our solution above is a bit tamer: (n * (n - 1) / 2) * 4. Our demo game board above shows 7 integer cards, so the initial execution of the center loop of this code will only run (7 * (7 - 1) / 2) * 4 = 84 times. Phew, that’s not too big. The next level will run 84 times with an n of 6, processing a total of 5,040 cycles just on that level. Ouch. Things get a bit scarier as we go on: Chewing through all the numbers reveals that we end up running 295,349,124 calculations. This involves lots of for loops and intermediate arrays to check and double check everything. There was trouble in the land of computational pancakes: stack overflow errors lead to trips to StackOverflow, which then broke, resulting in even more stack overflows, eventually throwing an overflow in my meatspace CPU so I called it a night and went to bed. At this rate, the time invested was just barely a net gain, given the algorithm would reveal the ideal solution. Calculords ceased to be a silly diversion and is now an obsession. I must beat it, by any means necessary! And so I did what any red-blooded engineer would do when faced with code that’s taking an eternity to run: I added a progress bar. Unfortunately, the performance improvement provided by marginally fewer garbage collections is, well, marginal. We started out with fast code. The overall runtime is slow because we’re running our fast code millions of times. Is there anything that can be done to reduce this number? Theoretically, we need to check all 295,349,124 possible results in order to ensure that we find the best solution. In reality, there’s a few shortcuts we can take. Our problem has a fortunate property: Once we’ve computed the solutions for a subset of our input, we don’t need to revisit it, regardless of order. [1,2,3] has the same result as [2,3,1]. We can record our position as we go along, and skip any further processing when we find ourselves on the beaten path. This path-tracking technique is known as Dynamic Programming. These few lines of code reduce the search space - by four orders of magnitude. Keeping track of already-calculated solutions allowed us to greatly reduce the amount of checks we needed. Tune in next time when I go completely overboard and build an OCR system in JS that can teach itself how to play the game so I’m not needed at all.